NextA Different Version of Herself: Erin McLaughlin talks about life as Ruby Force and her album Evolutionary War. It doesn’t come as a surprise that fans and industry insiders have embraced Meg Mac, especially her raw explosive vocals. Her reward, so to speak, is an Australian Record Industry Association (ARIA) nomination for Best Female Artist for 2017. It is indeed quite an accomplishment for the humble 27-year-old who grew up listening to her dad’s soul records. More recently Megan Sullivan McInerney (Meg Mac) has embarked on a stunning national tour with sold out shows across the country. In fact, I am about to experience my first Meg Mac show tomorrow night. I must admit, I am new to Meg’s music and in my endevours to discover a little bit more about her, I contacted her via EMI, who were amazing to deal with. Without further ado, on the eve of her The Forum (Melbourne) show, here is a little of what we talked about. Firstly, congratulations Meg on your ARIA (Australian Record Industry Association) nomination. How does it feel being nominated for Best Female Artist for 2017? And what does it mean to you, given the hard yards you put into making your debut album Low Blows? Thank you! It takes so much time and energy to make an album, more than I could’ve imagined. So things like this feel really good after finishing something that really challenged me. Your debut album Low Blows has been received quite well by critics and especially by the public. What do you think Meg it is about the album that has struck an accord with your fans? I like to read all the messages sent to me by fans and people listening to the album – that’s one of the only ways I can start to understand what my songs mean to someone else. Hearing what lyric or part of a song moved someone, I might have a feeling about a certain song but you really don’t know if anyone else will until it’s out there. You have spent some time in the US over the years, both recording and playing in west coast festivals and shows across America. How has your experience over there differed from playing shows here at home? Yeah and I ended up making my album in Fort Worth, Texas at Niles City Sound. Most of my touring in the US was supporting other artists, like my tour with D’Angelo. I’m playing to people that haven’t bought tickets to see me, people that haven’t heard me on the radio. It’s very different to playing my own shows. I understand you sold out five consecutive shows in Perth and others around the country recently. What has truly surprised you about your legion of adoring fans at your shows? Yes, almost had a week in Perth! The whole tour sold out pretty quick and I was adding so many shows I wasn’t planning on doing. It can make you nervous putting a big show on sale so to see them selling out is always surprising. If you’ve seen me play you might notice I like to look at everyone – looking at people and having a little moment is my favourite. My first Meg Mac show will be at The Forum in Melbourne tomorrow night. I am look forward to hearing your setlist. How much does it differ from show to show? Will there be any surprises for Melbourne? Thanks! I’ve been playing almost all of the album at most of the shows but have a few moments where it is just me and my keyboard or just me and my loop pedal on stage. And I’ve just done a Like A Version on Triple J so I think I might try playing that live in Melbourne this week. Which one song from Low Blows best encapsulates who you are as a person? And why? Probably Low Blows. I wrote it almost frustrated at not being stronger and not finding it easy to speak up – something I am still working on. I understand Edith Piaf is an influence in a lot of what you do, particularly your persona or stage presence. What else do you take from Edith as inspiration? You can hear it and you can feel it even when we don’t understand what she is saying. That’s what I find the most inspiring. Can you also tell me a little bit about your admiration for Sam Cooke? If you want to understand why I love Sam Cooke so much I would probably just put on A Change is Gonna Come really loud and make them listen to it. Two of my favourite songs, Every Lie and Never Be come from your self-titled EP MEGMAC (2014), yet I am also as equally blown away by much of Low Blows cathartic release. To me it is bluesy, soulful and dramatic at the same time, yet sad too, and definitely bolder than your earlier release. Do you agree or would you describe it any differently than that? I’ve always written in the same way, I sit at the piano and I sing and it’s always a cathartic experience. Making the album is the closest I’ve gotten to recording those original demos I’ve made on the piano. I took these recordings with me to Fort Worth and we started from there, pretty raw place to start. Finally, do you get nervous about what’s coming next (in the future)? Are there more demons musically speaking to exorcise? It’s so hard not to freak yourself out about the future. Plenty more dark places to go and I know there coming. 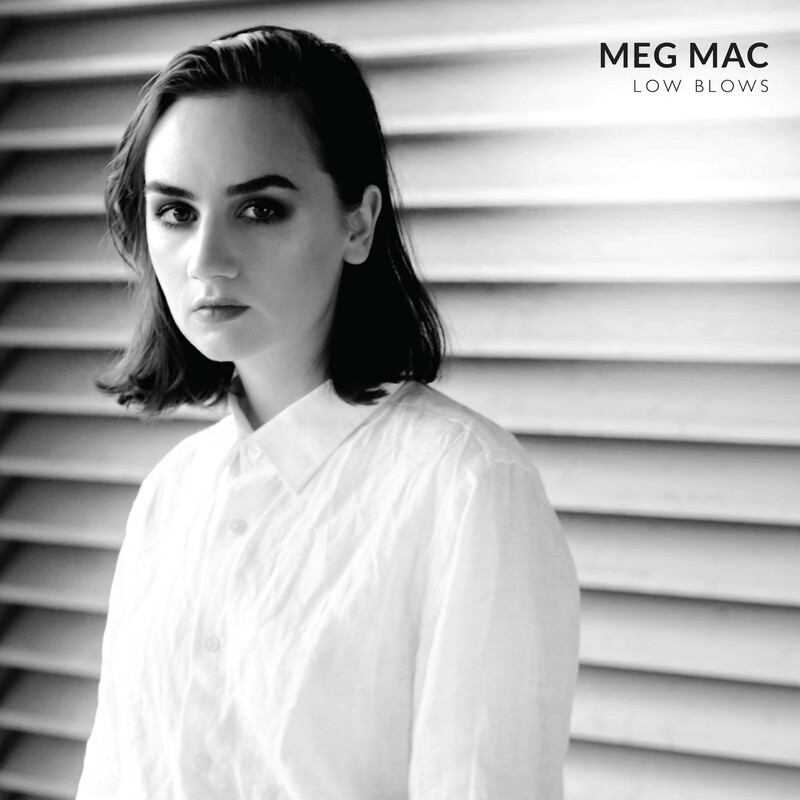 Meg Mac’s Low Blows is out through EMI Music Australia and available via iTunes. Meg Mac plays at The Forum in Melbourne tomorrow night (Dec 10). Also check out her remaining tour dates via her website. You can also connect with Meg Mac via her Facebook page or twitter feed @megmacmusic. Follow her on Instagram. Watch her on You Tube. Photo credit: The header image of Meg Mac is courtesy of EMI Music Australia. It cannot be used without their expressed permission. I am not the uploader of You Tube clip embedded here. A Different Version of Herself: Erin McLaughlin talks about life as Ruby Force and her album Evolutionary War.